The Department of Energy (DOE) is planning a life extension program (LEP) for the W-78 warhead, some 250 of which are currently deployed on 200 Minuteman III missiles. According to the figure below from the FY2011 Stockpile Stewardship and Management Plan Summary, the LEP is supposed to start this fiscal year, and production would run from FY2022-2025. However, because the government is operating on a Continuing Resolution, which rules out starting new projects like this LEP, the $26 million budget request is unavailable, and the timeline will almost certainly slip. However, the Minuteman III missile is scheduled to be retired in 2030, and it is not yet clear what will replace it. The Nuclear Posture Review notes that the United States will explore new modes of ICBM basing that “enhance survivability and further reduce any incentives for prompt launch.” This would include the option of using a different warhead. Eliminating the ICBM force should also be an option on the table, especially since it is the best way to reduce incentives for prompt launch. 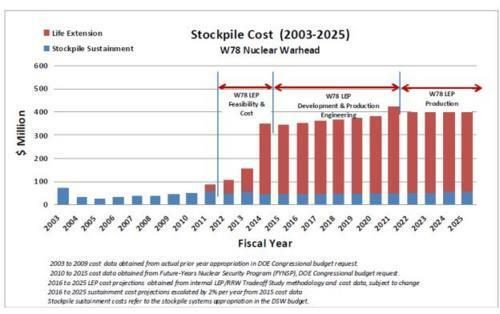 In either case, the new W-78 warheads could be in service for as little as five years, at an eye-balled cost (based on the above chart) exceeding $4 billion. For this reason, it makes sense to delay a decision on the LEP for the W-78 until a decision is made on the follow-on to the Minuteman missile. For the W-78, there are apparently some concerns about the long-term integrity of the primary, with rumors of potential corrosion problems, but there are no requirements for replacing any components by a particular date. Nothing would preclude delaying the LEP for a decade. Even if there was some uncertainty about warhead reliability, inspections could determine which warheads were in good shape, and the Pentagon could deploy those for the intervening eight years. The W-87 warhead just completed its life extension program to extend its minimum lifetime to 2030. Two hundred and fifty are deployed on 250 Minuteman missiles, and an additional 250 W-87 warheads are in reserve. Under the New START agreement, the plan is to deploy up to 420 ICBMs with single warheads, so there would be enough W-87s to arm 420 ICBMs and to allow for many years of future destructive testing as part of stockpile surveillance. As described in the NPR, the W-78 LEP study will consider the “possibility of using the resulting warhead also on multiple platforms in order to reduce the number of warhead types.” Specifically, the study will consider using one common warhead to replace the W-78 and the SLBM-based W-88, which is scheduled to follow the W-78 in the LEP queue. The shift would allow three warheads for two delivery vehicle types, relaxing the current requirement that each delivery system have two warhead options so there would be a back-up in case of catastrophic failure. Officials have also stated that a common warhead could reduce the number of warheads in the reserve stockpile. There are other reasons why eliminating the W-78 in favor of the W-87 make sense. The W-87 uses insensitive high explosive (IHE) to initiate the nuclear explosion; the W-78 uses regular high explosive, making it more susceptible to accidents that could lead to widespread plutonium dispersal. The W-87 also has more modern safety, security and use-control features than the W-78. They could redesign the weapon, using the so-called “replacement” option. But by changing the high explosive to IHE, the labs will be pushing the envelope of what changes they can make without a nuclear explosive proof test. The danger here is that if a potential reliability problem emerges in the future, there would likely be political pressure to resume nuclear explosive testing. They could reuse a primary from another, previously certified, nuclear weapon. This avoids the problems inherent in the replacement option. It appears that the administration is leaning towards the second option, and is planning to use—yes, that’s right—the W-87 primary! 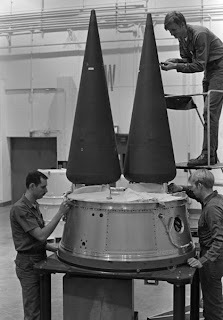 So it is only a small step farther to replace the W-78 with the W-87 warhead instead of just using the W-87 primary. Here’s an interesting tidbit. Los Alamos is scheduled to finish its production run of W-88 pits this year, after which, we’ve been told by a very senior NNSA official, it will begin production of W-87 pits. As it did for the W-88 pit, it will take several years for the lab to achieve a “diamond-stamp” certification for a new production W-87 pit. This effort, in part, is to exercise the pit production capability: NNSA and Los Alamos argue that if it is not producing any pits, things will start to fall apart. However, the W-87 wasn’t chosen at random; DOE will need more W-87 pits if it uses a W-87 primary in the W-78 LEP. What to do? The simplest answer is the best: skip the W-78 LEP and instead arm all U.S. ICBMs with the W-87. If that is unacceptable to the powers-that-be because they want a backup ICBM warhead, NNSA can use the W-88 LEP to create one when the time comes, as that is essentially a potential plan anyway. In any event, it certainly makes sense to delay the W-78 life extension program until a decision is made about Minuteman follow-on.